The Scandinavian is judged by many to be the #1 golf club in Denmark. The airport in Copenhagen was bustling with summer break travelers, tourists and youth teams. With a little effort I was able to break away and connect with my host, David Shepherd. David is the CEO of the The Scandinavian golf club. Many believe that the The Scandinavian is the #1 golf club in Denmark and I came to see what made that so. On the way there David informed me that summer had arrived with a vengeance in Denmark. Locals and travelers welcomed the sunny skies it had not rained in ten weeks. He alerted me to the fact that the course was desperate for any moisture. Both courses were in great shape…just not the green one expects when you hear the words golf course. 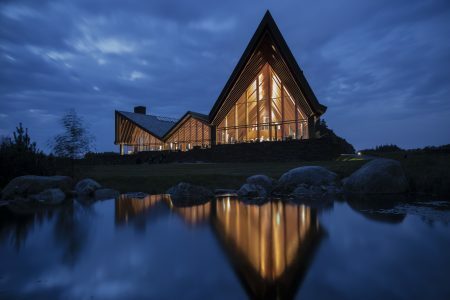 Unlike most golf course clubhouses, the clubhouse at The Scandinavian is far from customary. They took great care to make the building a statement rather than just a gathering area. The architecture design makes the building a work of art. With that thought, scattered throughout the building and grounds are pieces of art. Believe me, this is a clubhouse that will stop you in your tracks as you walk through the front doors. Martin, the golf manager, took me out to the guest house where I would sleep. The house only has three rooms but the are spacious and comfortable. Each room has an on suite. There is a good size open area that doubles as a kitchen, eating area and living room. It converts for meetings away from the clubhouse bustle. At dinner that night, David gave us the history of The Scandinavian. I’ll be talking about the dinner and restaurant down the page. 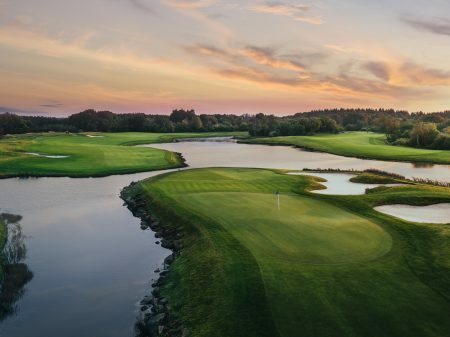 Three avid golfers decided that Copenhagen needed a world class golf course for members. Their collective experiences went into the creation of what they wanted in a golf club. They hired the firm of R.T. Jones II for the courses. Chief Design Officer, Bruce Charlton, designed two excellent 18 hole golf course. Each is different but the designers signature is clear in each one. Hey, Gene…what about the golf? Okay, let’s discuss the golf experience that awaits you at The Scandinavian. First is the practice facilities. The Scandinavian has an expansive driving range with many tee locations available. One of the positive aspects is the course offers free range balls. As David explained, “The Scandinavian believes that the golf experience should be all inclusive. Your fee will cover all the ancillary costs. We feel it deters from the experience to charge a green fee than add plus, plus to complete your round. The practice facility also includes chipping and putting greens as well as practice bunkers. After eight years of development and construction, The Scandinavian opened in 2010. The names of two golf courses are Old Course and New Course. The name New Course is a misnomer as it opened only six months after the Old Course. Each course has five tees to be friendly to players of all ability. Imagination helps as well as ability. On the two days I played each course, the fairways took on a sepia tone making the course look like an old photo. The courses were dry, but in excellent playing shape. The greens were green and rolled true. Despite the diabolical little curves and turns that seemed to always be in front of the hole, that is. The Old Course has a phrase on the website. It says, “Old Course is designed with the fundamental element that accuracy from the tee counts more than length.” One nice feature is one does get the feeling that your group is all alone on the course. If you keep your pace of play. There are five par threes and water protects all. I would think that it would take a few more rounds before finding your way to beat these holes. A favorite hole on Old Course for me is the second. Dissected by the creek, the second hole sets up two possible ways to the green. A drive down the left hand side will leave you with an option to go for the left side or hit over the creek onto the peninsula. I said two ways but the creek that snugs right up to the green narrows the left side. From the peninsula you have to hit back over the creek making even a short third shot interesting. Both courses are two loops. Each finishing hole on each side comes back to the clubhouse. I am particularly smitten with the 18th on Old Course. Challenging finish with a vista to stand on the fairway and admire. The word is that New Course was tighter. I didn’t get a feeling of narrow when I played. The designer recommends precise iron play and consistent course management. It’s true that setting up your next shot is paramount. The memorable hole on New Course is the eleventh. They built the golf courses on land once owned by the Danish Army. Hole #11 is the site of the rifle range. It’s a drive straight out to almost a 90º dog leg left. You then are looking right down the range itself. The fairway narrows down to the green sunk into a hollow flanked on three sides by trees and earthen walls. Take care, indeed. After your round you must enjoy the restaurant, The Waters. The service is impeccable and the chef has worked at Michelin starred restaurants. May I recommend you have the specialty, Tournedos Rossini. Beef tenderloin with fried foie gras, truffle, glazed green, new potatoes and Madeira sauce. The beef melts in your mouth and comes from cows fed dark chocolate. Whatever it does, the dish is delectable. Unlike most clubs, The Scandinavian business model is to build up membership. Once reaching an ideal number, the club closes to green fee guests. Most clubs are doing just the opposite. The Scandinavian believes that the club is the sum total of the people who frequent it. The staff bends over backward to ensure that your experience is the best. From the wait staff to the greens keepers you will only find friendly professionalism. 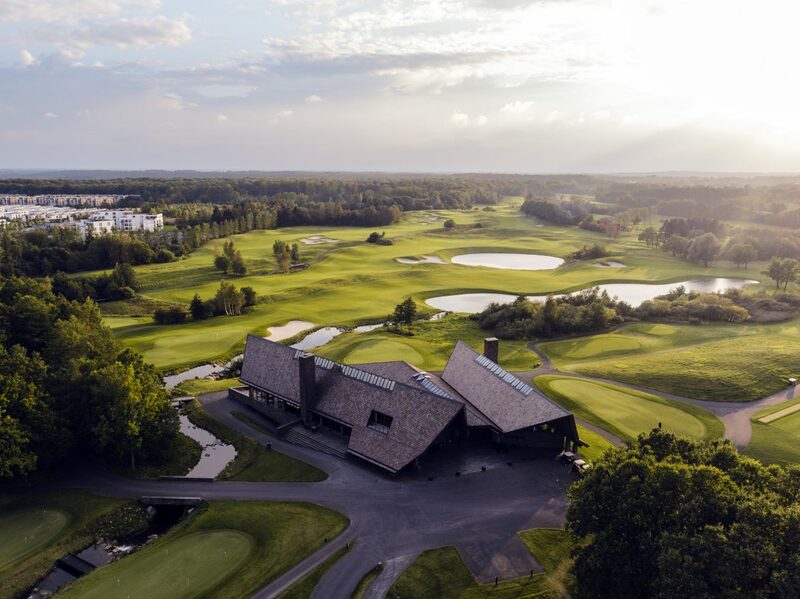 If you’re looking for a singular golf experience, experience The Scandinavian. But make it soon, because one day you might not be able to. And that would be a shame.